I’ve come to the conclusion that I’m a perpetual learner. Unless I have a strict education in something I feel ill at ease when approaching it. In college, before interviewing for a job at a stained glass studio, I took a private lesson with a stained glass dabbler so that I could familiarize myself with all the tools. I got the job because the owner of the studio knew my dad and she thought I was a responsible kid — experience never came up. After college I decided I didn’t want a real job but would rather work in a coffee shop. Before my interview I studied every tea and coffee they carried along with the origin of each. Not surprisingly, that never came up in the interview and I still got offered the job. Now I find myself performing the same sort of research when sewing. I’d like to some day claim the title of seamstress, but until I feel that I know all the pieces and parts and processes that go into making any and all garments, I’ll just stick to the title of Girl Who Owns a Sewing Machine. Currently I’m making a skirt and the pattern is labeled Easy. It’s so easy it’s taking me days to make. It’s not that it’s complicated — not at all — but you know the saying, “Measure twice, cut once.” Well, I have measured my hips and waist and measured again. I’ve ironed, cut and re-ironed all the fabric. I’ve read and reread the directions. I’ve stitched seams, ripped the seams and stitched them again. At first I was really disappointed in my slowness and all the repetition, but then I stepped back to look at the whole project. It’s still a simple skirt, but as I take the time and look at every step, I’m realizing what makes a quality garment and why. I’m using nice quality fabric instead of old bed sheets. I’m adjusting the tension on my machine properly instead of just putting up with whatever stitches it spits out. 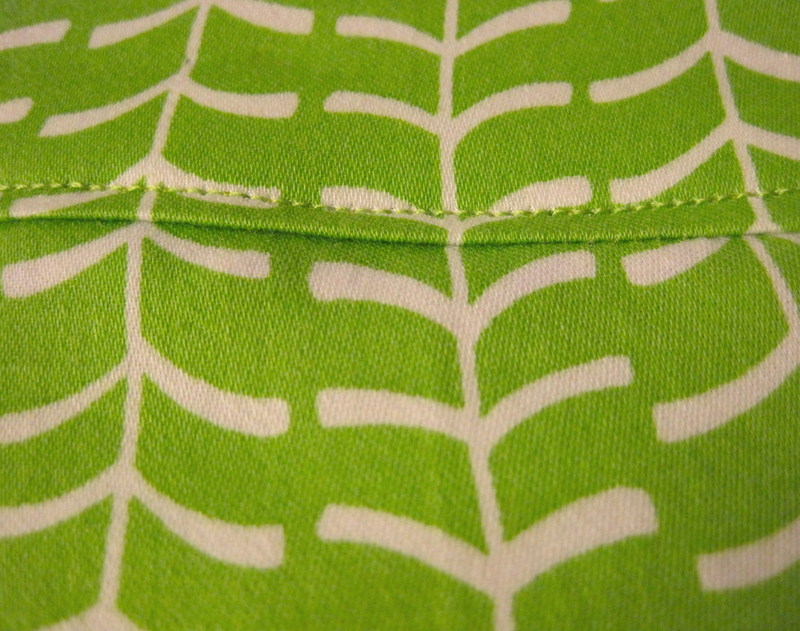 For the first time I’m using twill tape and interfacing, reinforcing what needs reinforced. With each new little project I take on, I’m learning a little more and feeling a bit more in control. Hopefully in the future I’ll learn enough so that new skirts can be whipped up in an evening, accompanied by a glass of wine, instead of over the course of a week, accompanied by a whole lot of angst. Tomorrow I’ll wrap up this little project so I can enjoy another summertime skirt — that is, if I can get the zipper in properly. I think I am just too impatient when it comes to sewing, unless I make myself do it by hand (as I was originially taught by Grandma!). I admire your fortitude. Love the new blouse, especially! Now, get me in the kitchen… and I will follow the rules to the letter and not complain.